MFA Now 2017 will be the fifth iteration of this biennial project at Root Division. The concept for the MFA Now archive and juried exhibition was originally conceived by Claire Colette and Kari Marboe in 2011. The two artists, who were, at the time, in MFA programs at Mills and UC Berkeley respectively, saw a need for dialogue between programs, and they created this opportunity for connection. As a space dedicated to providing opportunities to emerging Bay Area artists, Root Division has elected to continue this project biennially. The MFA Now 2017 Archive is an inclusionary publication of all eligible MFA candidates set to be released in March 2017. 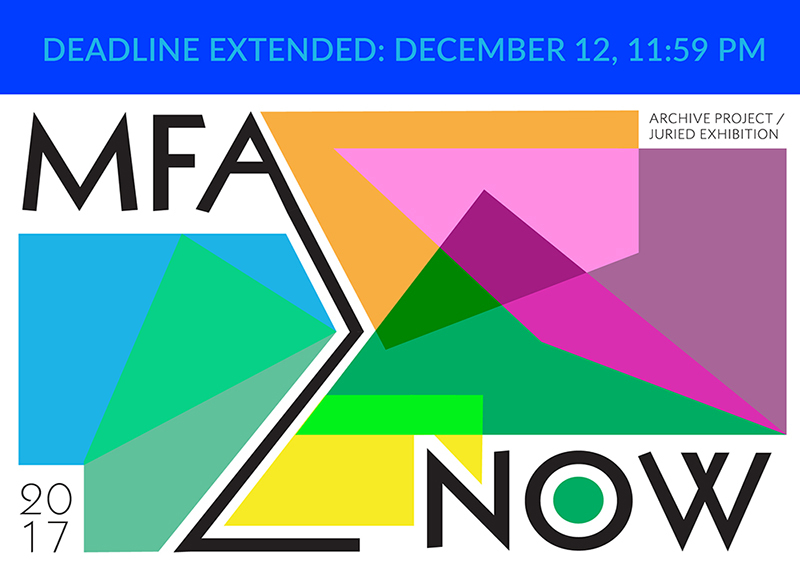 All artists who submit to the MFA NOW 2017 exhibition will be featured in this archive. The book includes a full page dedicated to each contributing MFA candidate and a compilation of essays by faculty, Root Division staff, and the exhibition juror, serving to navigate the contemporary moment in Bay Area MFA programs and find connections between the artists and institutions. The archive catalogue is designed by Gold Collective. Each artist will submit a single artwork inclusion in the archive publication and for consideration for the MFA Now Exhibition. The juror will select up to twenty-five works from the submitted materials to be shown in Root Division's gallery for the month of March 2017. An opening reception will be held on March 11th, and will also serve as the archive release party. To be considered for the exhibition, artists must complete the entire submissions process for the archive. The juror will review all submissions. We will notify selected artists of their inclusion in the exhibition by December 1, 2016. Covers an MFA candidate's inclusion in the MFA Now 2017 Archive, a copy of the archive, and a chance to be juried into the MFA Now 2017 exhibition at Root Division. Copies of the archive will be available at the opening and during gallery hours throughout the exhibition. (Please note that the $20 fee must be on file by 12/12/16 for the email submission to be considered. E-payment can be made here. Artists will be notified of their inclusion in the exhibition by January 5, 2017. All submitting artists will be featured in the 2017 Archive Catalogue.